It is always great to wake up to a Happy Start and McDonald’s Malaysia has done just that the other day on 13 April 2015. In conjunction with its third National Breakfast Day campaign, McDonald’s Malaysia has achieved yet another milestone by reaching out to more than 230,000 Malaysians. This year’s celebration also witnessed McDonald’s making the day a happier one for teachers by serving 11,650 educators with a McDonald’s breakfast – as a token of appreciation for their contributions in nurturing the nation’s children. “The National Breakfast Day is McDonald’s commitment to underline the importance of a wholesome breakfast. Themed “Start Your Morning Happy” this year, we are delighted that the celebration has managed to evoke smiles on the faces of our country’s early risers today,” said Stephen Chew, Managing Director of McDonald’s Malaysia. “The celebration this year is also a special one with McDonald’s making a concerted effort to honour our teachers. Every day, teachers rise up early to educate our kids. Their sacrifice and commitment towards nation building is priceless and McDonald’s is proud to be serving them today,” added Stephen. 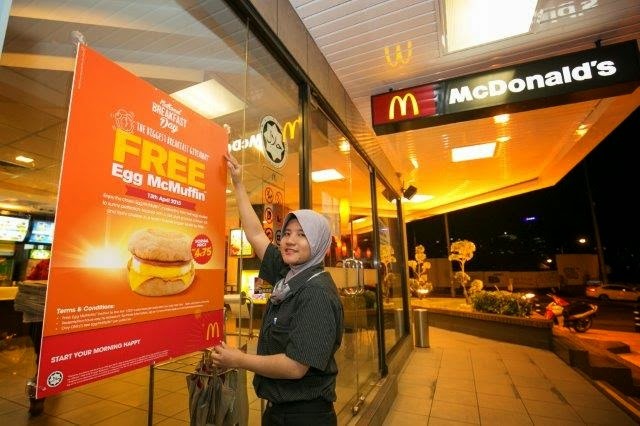 The McDonald’s National Breakfast Day campaign this year saw more than 230,000 free Egg McMuffins served to Malaysians from all walks of life. The nationwide breakfast giveaway was hosted by participating McDonald’s restaurants across Malaysia. Additionally, McDonald’s had also arranged for personalised deliveries of 11,650 Sausage McMuffins to teachers in various schools nationwide. During the week preceding this year’s National Breakfast Day celebration, McDonald’s Malaysia had also rewarded unsuspecting early risers by sponsoring 5,000 free LRT rides at KL Sentral and 5,000 free toll pass at Tol Awan Besar, Kesas Highway. Photos from the National Breakfast Day celebration can be viewed at McDonald’s Malaysia Facebook page.